1. Mix the flour, salt and 75g sugar in a large bowl; make a well in the centre and add the yeast. Warm the milk to just before boiling, then pour into the well, followed by the eggs; mix together to a smooth dough. Gradually knead in the butter with your hands – it will be become quite sticky but will eventually stiffen up. (Or mix everything in a freestanding mixer with the dough hook for 6-8 minutes, until smooth). Cover with cling film and leave for 2 hours, until doubled in size. 2. Preheat the oven to 180C, gas mark 4. Roast the hazelnuts for 10-12 minutes until golden. For the chocolate nut spread, blend 150g hazelnuts, 100g dark chocolate and the remaining ingredients in a food processor until smooth (if made in advance it will thicken, so add a splash of milk to loosen). Roughly chop the remaining nuts. 3. Knock the dough back, then roll on a well-floured surface to a 60cm x 40cm rectangle. Spread the chocolate nut spread over the dough, then scatter with the reserved hazelnuts and chopped dark chocolate. Roll up tightly like a swiss roll, starting from one of the shorter sides. 4. Trim the ends and halve lengthways using a floured knife. Tightly twist the 2 strips over each other so that the filling faces outwards. Shape into a round, pressing the 2 ends together, and lay on a parchment-lined baking tray. (See page 93 for step-by-step, illustrated instructions.) Cover with cling film and leave to rise for 45 minutes, or until doubled in size. 5. Bake for 35-40 minutes, until golden; cover with foil after 30 minutes if it browns too quickly. Put the remaining 75g sugar in a small pan with 75ml water; boil for 2 minutes, until syrupy. Brush ½ the syrup over the babka, then leave for 15 minutes and repeat with the remaining syrup. Cool completely on a wire rack before serving. 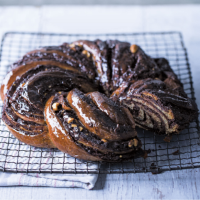 FYI: Babka means grandmother in Polish, and this traditional Eastern European bake conjures up a sense of family, celebration and sharing. This recipe was first published in Sun Feb 01 11:50:00 GMT 2015.